Hey there. I've decided. 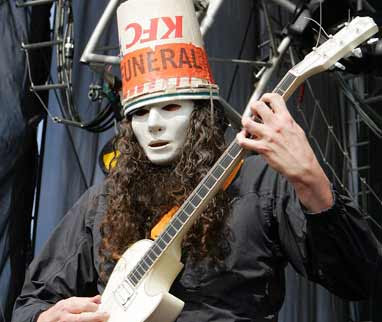 I'm going to be Buckethead for Saturday night. I mentioned earlier that my wife set up a game night for this Saturday and the twist added is that guests would need to be dressed up as a musician. My wife has already called a "preggers Gwen Stefani" while I was still undecided... until today. While driving to work this morning, my wife showed me a picture of a friend that sent a text message to her. She was wearing a hat that resembled something like the hats worn by the "Hot Dog on a Stick" workers. Then, it dawned on me. I shall be Buckethead! lol Funny how you associate 2 completely unrelated items. 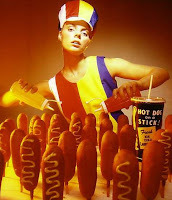 In this instance it's Hot Dog on a Stick and Buckethead. I laughed and told my wife that we need to get a bucket of chicken and a white mask and I'm set. So far, I know of 3 "rockers" that will be attending Saturday. We have Buckethead, Gwen Stefani, and Maynard (Tool). Everyone is else is keeping quite of their identities. Hopefully, we won't get any people that will flake out and not come in costume. Later! hey first time here, came over from on the front porch. great joke underneath and sounds like you'll be having a fun partay.......it's great to have an imagination and put it to good use. awesome, you'll be taking photos right? nice way to get a designer party i must say.